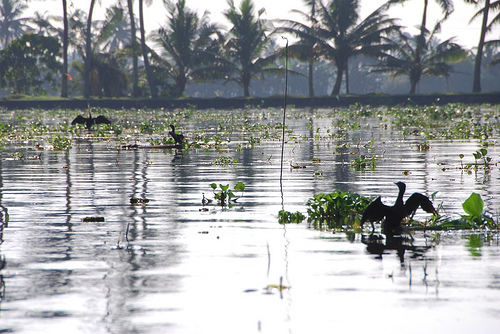 The main reason Suhail and I wanted to travel to Kerala was to do one of the famed backwaters tours. One of the biggest tourist draws in the state, there are a few types of tours available, ranging from a few hours on a slender punted boat all the way up to a luxurious night on a houseboat. We had a few setbacks and for a moment, it looked like we may not make it to Alleppey at all, but once things got sorted, we left Fort Cochin by and stood on a packed bus for the entire one hour trip to Alleppey. 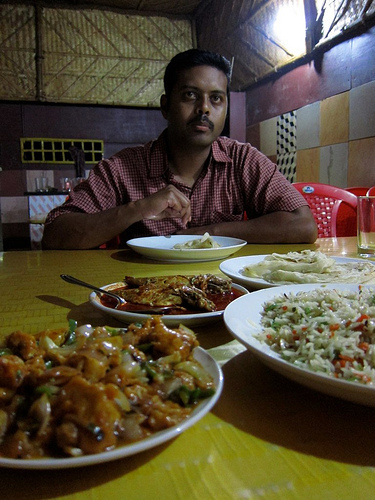 Our friend, Leelu, in Fort Cochin recommended we stay at a friend’s homestay, which sounded great to us. It turned out her friend owns a few places and the one that most closely matches Leelu’s was not available. While the room we ended up with was much more basic, it was clean enough and only cost 600 Rupees a night (about $13!). Once we got settled and enjoyed much needed showers (did I mention that bus was not air conditioned? 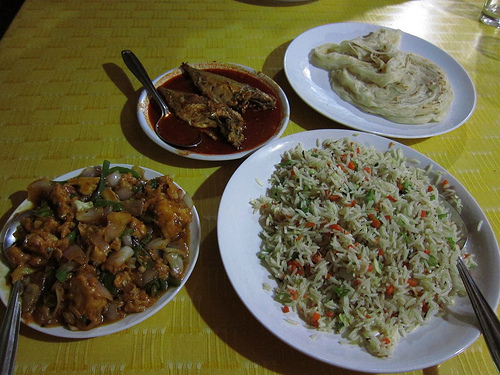 ), we set out to get some much needed dinner. After doing our research, we opted for a 5 hour punted tour with a guide who was recommended in our Rough Guide to South India (Mr. KD Prasenan – http://www.keralavillagecanoetour.com – we didn’t even know he had a website, we just called him and set it up the day before: 093888 44712). Not only is this option more environmentally friendly, the smaller boat moves at a more relaxing pace and allowed us to travel via smaller canals. 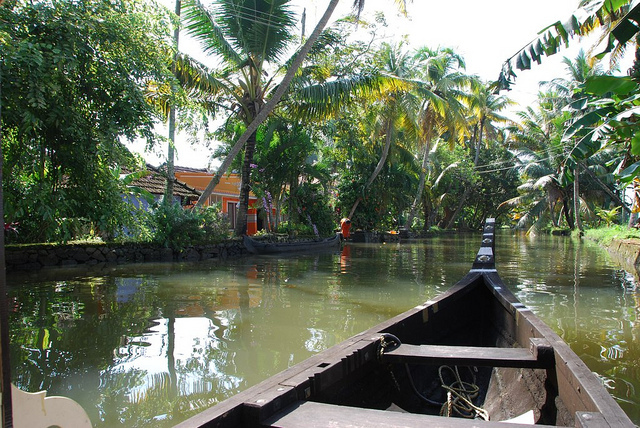 As we got to see up close, these canals are a central part of the villagers lives. We saw folks fishing, doing their laundry and washing breakfast dishes in the canals. Although I am sure they have mixed feelings about a couple of Americans floating through their laundry room, we did not feel too obtrusive since we were on a small, quiet boat. As you will see from our photos, the houseboats are hulking masses that clunk through the wider canals. 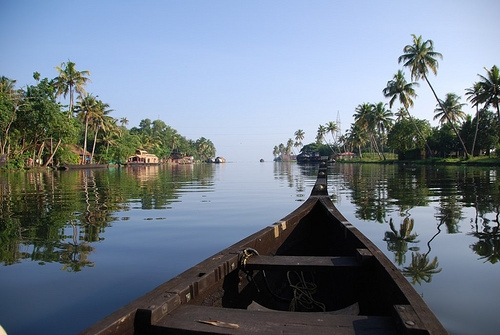 It was easy to see that experience, though probably also nice, would have provided far less insight into the culture of the backwaters villages. Some of the boats even had satellite dishes! 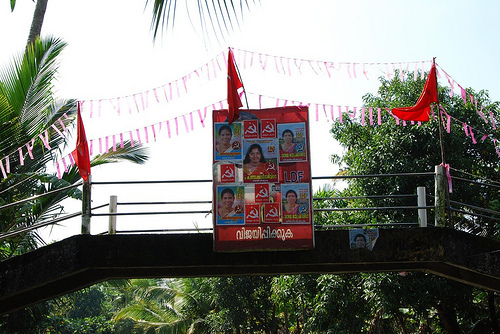 Kerala is a communist state and the elections were taking place while we were there. Hammers and sickles everywhere! All in all, the boat trip exceeded our expectations and was one of the highlights of our entire trip to India. Highly recommended…check out all the photos for yourself! Thanks, this is very helpful in making our decision. We will take this tour instead of staying on a houseboat. Great site, btw. Clearly you’ve put in a lot of effort. Thanks for your kind words and we are so happy to have helped! I think you will be satisfied with the decision to go with a smaller boat. It is a completely different experience and actually allows for some peace and solitude – rare gems for anyone traveling in India! Have a great trip! © 2010 Mint Jellie. All images are copyrighted by their respective authors.